Now that's how you write an SEO-friendly headline! 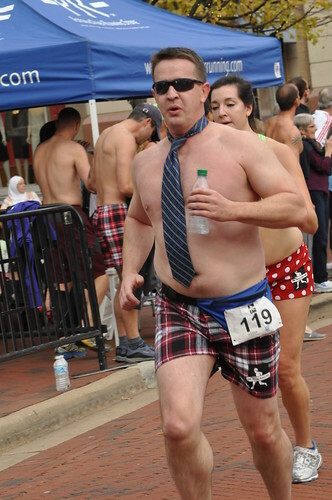 Please to be enjoying a couple of pictures from last weekend's Nearly Naked Mile race at Reston Town Center, courtesy of Potomac River Runners' exhaustive Flickr feed. 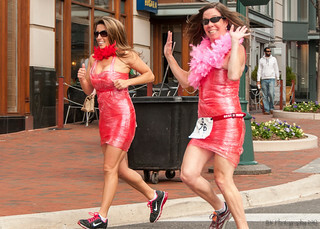 These two women were wearing outfits made of cling wrap, which begs the question of how they managed to walk, let alone run. Lest anyone accuse us of crass sexism, here's some beefcake dude wearing a tie. And that's all we've got to say about that. A few more posts like this, and we'll be up to our second millionth page view in no time flat. How I didn't stab my eyes out afterward is beyond me. Hey, how did my picture get up here?